After protesting in Rio, Feyisa Lilesa has arrived in the United States with a message of hope for his people in Ethiopia. WASHINGTON, D.C. – Feyisa Lilesa finally cracked and broke down in tears as he watched his fellow Oromo people give thanks in a series of video messages for his stance of solidarity with them. A 14-year-old Oromo boy from Houston said “Thank you” and “Good job.” A member of the U.S. National Guard with Oromo roots gave him a salute while in full uniform. Lilesa held the phone close to his face and let out a smile. 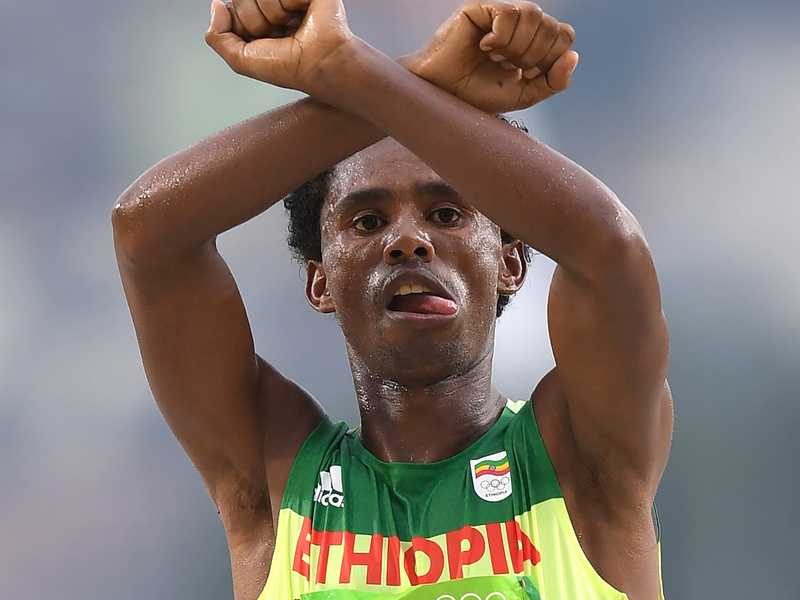 When Lilesa extended his arms with his fists clenched and his forearms crossed in an X-shape as he ran down the finishing straight to take the silver medal in the men’s marathon at the 2016 Olympics in Rio de Janeiro, it was a sign of power and restraint in a defensive posture symbolizing peaceful resistance. The demonstration was aimed at raising awareness to the killing of the Oromo people in Ethiopia—the country’s largest ethnic group who are being oppressed in response to their peaceful protests in favor of political reforms. In the post-race press conference in Rio, he said that he feared for his life and believed he would be killed or held captive if he returned home. The same thing that drove him to protest at the Olympics is what made him cry less than 10 minutes before he walked out to address the media in his first U.S. press conference on Tuesday afternoon. Speaking to a room of about 25 reporters and a few Ethiopian admirers, Lilesa reiterated that his upbringing on a farm and the values instilled by his family reminded him of the people who are being driven out of their homes and killed in the Oromia region. With his legs churning away but his mind focused on the killings at home, he aimed to make the podium in Rio in order to have the opportunity speak out for those people. In Oromo culture, young men are taught to respect, listen to and follow their elders. Seeing Felema, a woman old enough to be his own mother, dressed in a traditional shari and saying that he is a hero was enough to overcome Lilesa with emotion. “This video confirms how much people are suffering and the pain that they feel along with how much they’re yearning to be heard, seen and desired,” Lilesa told SI through an interpreter, something he didn’t have in Rio de Janeiro as Ethiopian staffers feared for their own lives if they helped Lilesa. Oromo farmers started being displaced when the government contemplated plans to expand the capital into the Oromo territory. While the plans have reportedly been put on hold, security forces continue to arrest and even gun down peaceful protesters. Lilesa stood outside of the press conference area in Rio whispering this message to reporters. A video of his plea was recorded and uploaded to LetsRun.com and that was the last reporters were able to get a hold of the new silver medalist-turned-activist. Lilesa says that he returned to the athletes’ village and packed his things before heading to the closing ceremonies at the Maracana, where it was expected that he would raise his arms again as he received his silver medal. On the ride over to the stadium, Ethiopian handlers from the track and field federation told him that they feared he would be fined and potentially lose his medal, if he chose to protest. International Olympic Committee officials also informed him about the rules against political demonstrations at the Games under Rule 50 of the Olympic charter. The act was not necessary a second time, as his arms remained at his side and IOC President Thomas Bach whispered congratulations into his ear and then told Lilesa that he was safe. Lilesa then collected his belongings from the athletes’ village before heading to a hotel that had been paid for by Oromo supporters in the United States and around the world who had learned of Lilesa’s demonstration through social media. His cellphone had international service, which allowed him to see that his social media accounts and messaging apps had been buzzing non-stop. Lilesa waited to contact his family in Ethiopia, which includes his wife and a five-year-old daughter and three-year-old son in Addis Abba. His wife was shocked by his decision to protest and repeatedly made calls to check on his safety. With the Olympics wrapped up, Ethiopian government officials said that he would be welcomed back home like a hero and that he had no reason to fear for his life. This is the same government that has killed more than 500 Oromo people since November 2015 and arrested thousands of others. Lilesa chose to remain in Brazil before deciding his next move. He remains in constant contact with his family, although reaching his parents is sometimes difficult due to internet and telephone availability in the countryside. Lilesa also follows the latest news on the Oromo protests through social media, where he also discovered that a GoFundMe page for him was started less than 24 hours after his marathon finish. The site collected more than $50,000 in the first day and has now raised more than $162,000 in less than a month. Lilesa earns most of his money from his sponsorships, race appearances and winnings and says that, while he is grateful for the money that has been collected, he has not accessed it yet. Oromo people donated. They changed their profile pictures on Twitter and Facebook to the image of Lilesa crossing the finish line. They wrote songs about him. After he addressed fellow members of the Oromo community and members of the U.S. Senate, people rushed to get their photos with him, posing with their arms crossed in solidarity. While his 2:04:52 personal best makes him the 10th-fastest Ethiopian of all-time in the marathon, it is the simple act after the Olympic race that has made him an icon to his country. Lilesa set an example that would be replicated when his compatriot Ebisa Ejigu also crossed his arms when he won the Quebec City Marathon on August 28 and most recently when Tamiru Demise took silver in the men’s 1,500 meters at the Paralympic Games over the weekend. A marathon can take a toll on any runner’s legs, and Lilesa took a 10-day break following the closing ceremony in Rio. Fearing that he was being watched, he kept to himself for that time. Brazilian Oromo sympathizers assisted him for a few days as members of the U.S. foreign ministry arrived to help. Lilesa has since been granted a U.S. visa that allows him to train and compete in the States through January 2017. He is exploring the possibility of moving to Arizona or New Mexico to train at altitude with other Ethiopians before resuming competition. He has repeatedly told reporters that he is not seeking asylum or U.S. citizenship at the moment. If he was granted an opportunity to run competitively for the United States, he may decline. As for the silver medal that allowed for him to step on the podium and speak out, it sits in one of the bags that he packed in Rio. He hasn’t looked at it since arriving in the United States. Most of his time has been spent speaking, and following the press conference on Tuesday he took a moment and replied to the video messages that were sent to him.